Political Bullying Is Wrong. There, I said it. Bullying’s long history in American politics doesn’t make it right. I just re-read the About page and remembered that this blog’s focus is on standing up to political bullying of progressive Americans. Because some posts refer to conservatives or radicals, I’m going to make clearer that Framology’s opponents are not conservatives or even radicals by revising these terms to bullies, political bullying, etc. in past posts. It will take a little while, and if I miss some, I’d appreciate it if you would point them out. As stated in the About page, America has always had a range of political opinion, and that’s as it should be. I wouldn’t want Americans to all believe alike. 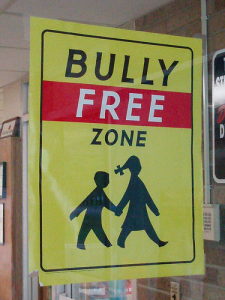 This is the bold vision of Framology: American politics as a bully-free zone. But bullying fellow Americans to advance political agendas is wrong. 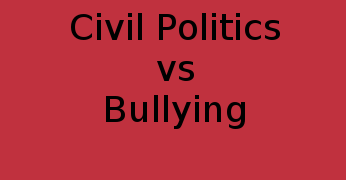 And the only way to end political bullying and create a more civil politics is to stand up to it without bullying in return. Framology’s role is to help progressive Americans find the words to confidently do this. What do you think of this list? What’s missing? Do you think some should be removed?